NETELLER – The Perfect Payment Method for Sports Betting, Almost! If you have already used NETELLER for online payments, you know exactly how sharp and efficient it is as a payment method. The sheer number of websites you can use it on and the multiple options you can upload funds to it make NETELLER one of the best electronic wallets out there. And, there’s a lot more where that came from! NETELLER is also one of the most-used payment and withdrawal method for punters within the UK, as well as the rest of the world. So, if you want to get more info on what the advantages of using NETELLER for sports betting are, as well as the Top NETELLER Betting Sites that accept NETELLER, stay tuned. Being such a popular payment method, NETELLER is on the banking pages of most of the online betting sites out there. Since there are many e-wallets on the market, delivering optimal services for betting is very important, and NETELLER does an exceptional job in that regard. In case you wondering which are the recommended sites where you can use NETELLER, we can help you obtain the perfect betting experience by sharing the Top 3 just below. No matter which one you choose for placing your sports bets, you get a guarantee on the quality and speed of payments and withdrawals. bet365 is one of the biggest betting sites available online and things have been that way for quite some time now. The fact that bet365 keeps NETELLER very high on their list of accepted deposit and withdrawal methods can’t mean anything but an extra seal of approval and guarantee that you’re making the best possible decision. You shouldn’t worry about any fees or taxes being charged by bet365 when you choose to withdraw or deposit with NETELLER. Furthermore, both the deposit and the withdrawal processes are instant at bet365 when using this payment method. Indeed, a short period might pass until the betting site approves the withdrawal request, but afterwards, you get the money in your NETELLER account instantly. The minimum accepted deposit you can make using NETELLER at bet365 is of £15, while the maximum amount you can deposit in one-go is £37,500. High-Rollers will have an extra reason to enjoy the high limits of this payment method. Of course, you don’t have to be a high-roller to enjoy the advantages of NETELLER, since the services offered are the same for every customer, no matter the amounts. Perhaps the only downside when it comes to using NETELLER at bet365 is the fact that you won’t be able to claim a first deposit bonus, as mentioned in their Terms and Conditions. As mentioned in the introduction of this article, NETELLER is a payment method backed-up by most online betting sites out there and especially the UK-orientated ones. So, it comes as no surprise that Ladbrokes is also happy to offer NETELLER among their recommended payment methods. Not only that, but Ladbrokes also dedicated an entire section of their FAQ for questions related to NETELLER and the use of this payment method on their website. You will find all the relevant information there. However, we will also provide some insights that might interest you right here and now. The minimum deposit, for example, that can be made by NETELLER at Ladbrokes is of £10, while a maximum is not specified. All deposits made by NETELLER are instant, and withdrawals might take a maximum of 24 hours until the finance department processes them. Remember, this is the amount of time necessary for the betting site to make sure everything is in good order with your withdrawal, so you will get the funds instantly after this process is over. Betfair revolutionised the way betting sites work by being the first betting exchange to operate online. Always on the lookout for ways to improve the betting experience of their customers, they turned to a fast and reliable payment method such as NETELLER, to offer all customers a smooth banking experience. Betfair offers a traditional sportsbook, as well as the betting exchange at the same time, allowing their customers to choose the product themselves. The same happens when it comes to payment methods, and there’s a big difference between them and the other betting sites. We’re referring to the fact that you will be able to enjoy the New Customer promotion when depositing with NETELLER. We couldn’t present this payment method without slipping some of the advantages as well. However, do not worry, there is plenty yet to come, and you’re about to discover them all. We’ve already mentioned speed and versatility, which are two great characteristics for a payment method. What else? User friendliness is another huge feature that makes NETELLER so good when talking about depositing and making withdrawals at betting sites. Through NETELLER, you will be able to choose from a large number of different ways to transfer your funds once cleared by the betting site. With the increasing set of regulations regarding transfers and information, it’s nice to know that you can count on a fast and secure payment method such as NETELLER. Indeed, we’ve briefly been through some of these advantages already. However, in the following sections, we will be taken each one individually and express why NETELLER offers better services compared to other payment methods. Most of the times, betting sites prefer to put limits on their deposit methods to prevent any shady activities such as money laundering or fraud. However, customers that are using NETELLER come with an extra layer of trust and that allows betting sites to increase those limits. For example, while a credit or debit card will only allow you to deposit £2,000, using NETELLER, you can deposit more than £35,000. The same applies when it comes to cashing out your winnings since most of the traditional payment methods will apply limits on the amount they can process in one batch. All payment methods are considered to be secure nowadays. Even so, it’s safe to conclude that some are safer than others. Speaking about NETELLER, it keeps you safe by never having to disclose credit card details. Furthermore, it comes with a built-in safety system regarding the account itself. Right after you create the NETELLER account, you are asked to verify it through a series of official documents as part of their standard Know Your Customer procedure. Once you complete all the steps, you can be sure that your account is safe from any attacks. The two-step authentication is another big plus regarding NETELLER safety. We’ve already been through the fact that deposits and withdrawals transfers are instant into your account. Those are great features that refer to the speed and accessibility of NETELLER, however, there’s more than just that. We’re pointing to the fact that you won’t need anything more than your NETELLER email address or Secure ID and the password to deposit at any betting site in the UK. No more complicated details to remember or complete, no extra fields that take much time. Now that you’re aware of all the good sides of NETELLER and you know its capabilities, it’s time to turn our attention to some things that aren’t necessarily top-notch about this payment method. Most articles reviewing NETELLER will let these things slide. However, we want to provide a complete overview of NETELLER as a payment option for betting sites, and that’s exactly what you are getting. 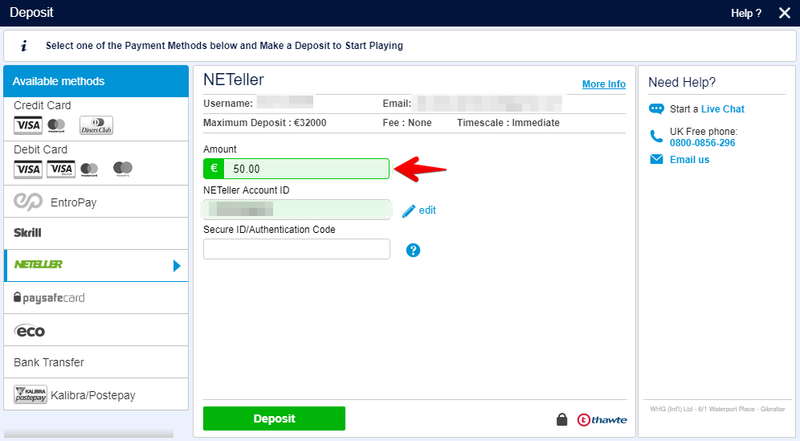 One of the things we didn’t find fair about NETELLER’s way of doing things is the fact that you can’t change the currency of your account once you create it. So, in case you’re moving to another country or travelling for a longer time, you’ll need to create a different NETELLER account. Another flaw of NETELLER and their services is related to the speed with which they can suspend your account. It’s nothing very serious as it is a protocol for further security checks that are, in the end, for your benefit. However, they could send out a warning or allow you to take out the funds before blocking it for further checks. 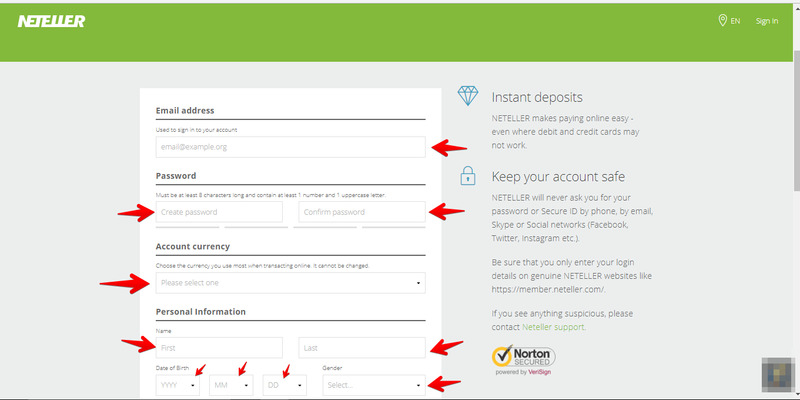 You need to pay extra attention when you choose to upload funds to your NETELLER account using certain methods. For example, if you want to add money from a Paysafecard, which is a product of the same company, you will have to cover a fee of 7%. It’s 3% if you use Skrill to upload funds and around 1.5% when using credit cards. Bank Transfer, on the other hand, is free to use, but you need to keep in mind that it can take up to 3 business days to complete the transaction. Now that you know all the advantages, as well as the disadvantages of using NETELLER to fund your player account at your prefer betting sites, it may become easier for you to have a detailed picture about it. However, to be able to enjoy all the advantages of using NETELLER, you must make your first transaction with them. The next step is entering the amount you want to deposit. Click on deposit and then wait for the transaction to process. 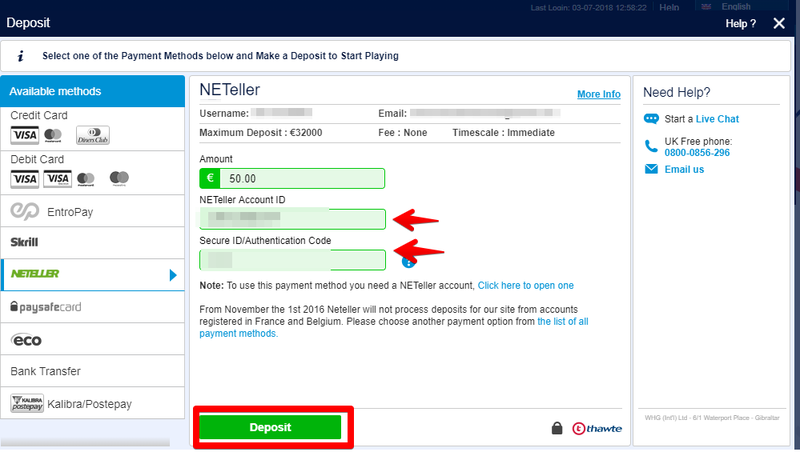 Just in case the amount you are depositing is not available on the NETELLER account, you will be asked to provide further details for fueling your NETELLER account. We’ve covered all the aspects regarding the use of NETELLER on betting sites, including fees, transfer speed and even a step-by-step guideline to make a successful deposit. Now it is time to get back to basics and refer to those users that do not have a NETELLER account at the moment. After you fill in the personal details, click on Open Account, and that’s it! 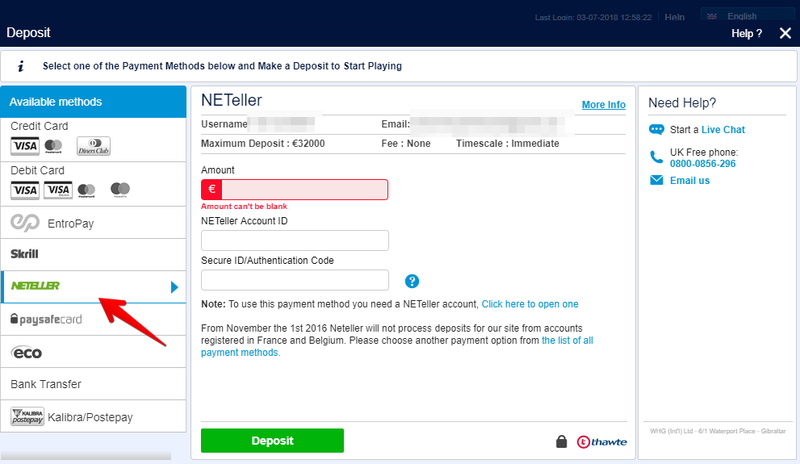 You will see a final screen where you can click on ‘Deposit’ to see the options you have to upload funds on the NETELLER account. Based on previous experiences, as well as all the data provided above, you can agree that NETELLER is a fast payment method. Its exceptional speed applies to both depositing and withdrawing funds. It is now time to check how some of those stats work on the top UK betting sites. With all the care and dedication put into all other features of this payment method, the mobile version for NETELLER couldn’t follow lower standards. First of all, you should know that there’s a dedicated mobile app for both iOS and Android that you can download from the App Store or Google Play. From a betting perspective, NETELLER offers the same functionality and speed as on any desktop platform. You might even see better speeds when it comes to depositing with NETELLER on a mobile device since the betting site mobile app doesn’t include some of the steps. The bottom line is that if you’re the kind of punter that mainly bets from a mobile device, you can choose NETELLER without thinking twice. You can find pros and cons for all these NETELLER alternatives since, as stated at the beginning of this article, there’s no perfect payment method. Skrill is very much similar to NETELLER in many aspects with a big difference when it comes to supported currencies, and available fund loading options. EcoPayz, on the other hand, might offer you lower fees for moving the funds from NETELLER to your bank account or card. However, you should also know that withdrawals processed via EcoPayz might not be instant at some betting sites. Last but not least, the classic credit or debit card as a deposit and withdrawal method offers the advantage of not having to deal with any further transfer of funds to get the money directly into your account. However, you might be facing higher fees and a longer time for the money to get on your card. How Long Does it Take To Verify NETELLER? You can verify your NETELLER account by uploading the requested documents. The verification process can take from 2 to 10 hours, depending on the volume of active verifications currently in process. Can You Buy Bitcoin with NETELLER? Yes, NETELLER allows you to buy Bitcoin through their interface instantly. The collaboration between CoinCorner and NETELLER makes it a very fast and easy process. What is a NETELLER Card? The NETELLER Card or Net+ is an attached pre-paid MasterCard that fueled directly from your NETELLER account. You can use it to withdraw funds at the ATM or pay at online and physical stores at a POS. How long does it take to withdraw from NETELLER? If you have a NETELLER Card you can withdraw instantly any money that are currently on your NETELLER account. If you want to withdraw to your bank account, it will take the usual 48 to 72 hours. What should you know about Neteller?